Show your good taste with this large tin basket filled with abundant selection of traditional favorites like Angelina's butter cookies, a sparkling beverage, wine and cheese biscuits, Sparrer's sausage, chocolate cherries, biscotti, Focaccia crisp crackers, East Shore pretzels, Dolcetto wafer rolls, truffle cookies, Reese olives, Fairwind gourmet coffee, Mount Bleu Fromage cheese bar, Bellagio cocoa, chocolate truffles, Vineyard cheese spread and the exquisite Tortuga rum cake. We provide delivery and shipping services from Monday to Friday. For more information and transit time for your order, please read Shipping Rates and Policies. Our original handcrafted gift basket is created exclusively by Delight ExpressionsTM. Purchases made from another vendor, can not be granted with the originality of the product you receive. 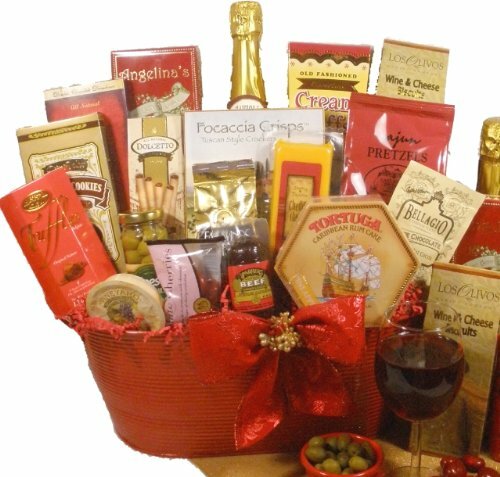 Show your good taste with this large tin basket filled with an abundant selection of traditional favorites like Angelina's butter cookies, a sparkling beverage, wine and cheese biscuits, Sparrer's sausage and more. Perfect to send your warmest wishes and cheer this holiday season for family or as a corporate gift. All of our Gourmet Gift Baskets are beautifully hand wrapped and include your message in an enclosed card. We provide delivery and shipping service Monday thru Saturday. For more information, see Shipping Rates and Policies. If you have any questions about this product by Delight Expressions, contact us by completing and submitting the form below. If you are looking for a specif part number, please include it with your message.